In the dead of night on 20th March 2003, Royal Navy marines from 40 and 42 Commando climbed on board a fleet of twenty helicopters. With faces blackened and mouths dry at the thought of what lay ahead, they are going to land in Iraq, and capture the oil pipelines and pumping stations through which 90% of Saddam Hussein’s oil is exported. They will be the first troops on the ground, literally kicking down the door, expected to seal off the whole of the al-Faw peninsular and hold it against any counter-attack by the Iraqi Army. Operation Telic was a bold and audacious break with military doctrine, a night time airborne assault against heavily defended positions. Lightly armed and isolated, the Commandos’ only support for the first few days would be from the two ships HMS Ark Royal and Ocean sailing off the coast. The helicopters took off. Then the leading formation hit a sand storm. A helicopter pilot became disoriented and 42 Commando’s leading unit died in the resulting crash. 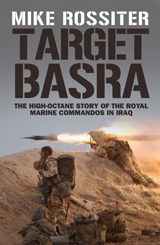 Target Basra continues the story of the landings, as the Royal Marines fought to secure their objective, and then advanced up the coast towards Basra. They were engaged in a series of fast moving and hard fought battles against Iraqi Army tanks, Ba’ath Party Fedayeen and Republican Guards. Finally, they fought a two-day battle, at Abu al-Khasib, which broke the back of the Iraqi resistance. Eighteen days after their first landing in Iraq men from the Royal marines entered the presidential palace in Basra. I had access to personal and official diaries, and conducted interviews not only with the officers and with men of 40 and 42 Commando but senior officers attached to the United States Central Command and the US Navy Fifth Fleet in Bahrain. Target Basra tells the detailed story of the planning and negotiations behind British participation in one of most controversial military actions of modern times, taking the reader from conferences in Tampa Florida, to the vicious fire fights of D Company, 40 Commando at Objective Taku in Abu al-Khasib. With Basra taken the company commanders are equally candid about their role as peacetime administrators, and their realisation that whilst they had won the war, they were about to lose the peace.